According to the meteorological agency, cedar pollen counts could be twice as high this year compared to last year. Bad news but I think it’s true. My nose can tell. I have hay fever. If you’re suffering from hay fever, you are allergic to pollen. Actually, people can be allergic to different things. If cats make you sneeze, you may be allergic to cats. When I eat shrimp, I get a rash around my neck. I think I have an allergy to shrimp. A friend of mine has a metal allergy. She must be careful about the jewelry she wears against her skin. Now, I guess you’ve noticed there are several ways of saying you have hay fever. First, use be-verb and say you “are allergic to” pollen. 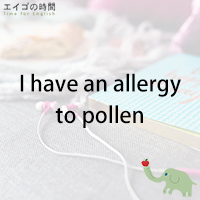 Secondly, use the verb “have” and say you “have an allergy to pollen”. You can also say you “have a pollen allergy”.